In the morning we had climbed Ampersand Mountain (a seperate post) in Saranac Lake, but since ist was only 2 PM after we ate lunch there was plenty of time for a kayak adventure. We drove 30 minutes north to Paul Smiths and then went about 3 miles west to Keese Mill on the Keese Mills Road. At Keese Mill there is a nice kayak launch site with plenty of parking. There is an additional parking lot several hundred feet further down the road providing trailhead parking for St. Regis Mountain. We launched our kayaks about 3 PM not knowing how far we intended to paddle. We did not have our camping gear in the boats. As we made our way east on the river we passed an unnamed leanto shelter on the right almost immediately. It was occupied so we didn't set foot on land to explore. We did stop about a mile further on the stream to look at Bent Spike leanto before continuing on until we got to Lower St. Regis Lake. Paul Smiths College sits on the east shore and is easily identifiable. As we entered the lake, we saw Peter's Rock leanto sitting on a beautiful point on the western shore (on our right as we entered the lake). It was unoccupied, so we decided we would spend the night there if it was still available later in the day. We continued on into Lower St. Regis Lake. A loon was swimming nearby. He kept diving for food, and once surfaced about 5 feet in front of my kayak before quickly diving again. I was surprised by how far he could travel underwater before resurfacing. We decided to continue paddling south through Spitfire Lake and and into Upper St. Regis Lake before returning. 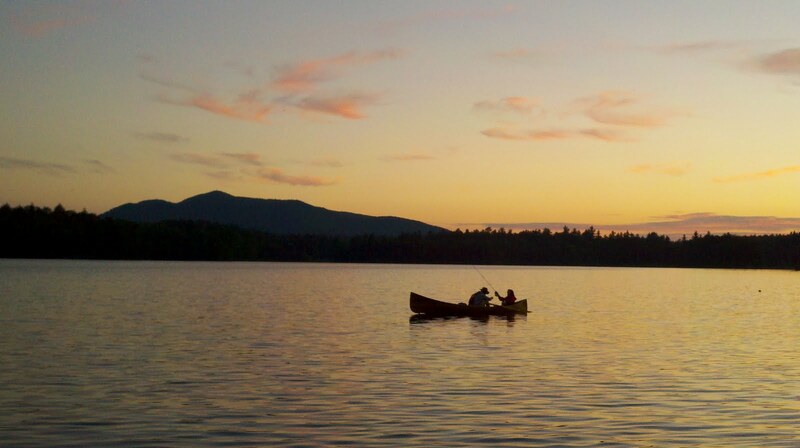 As you finish paddling through the channel and enter Spitfire Lake, a beautiful Adirondack camp sits on the left (east shore). 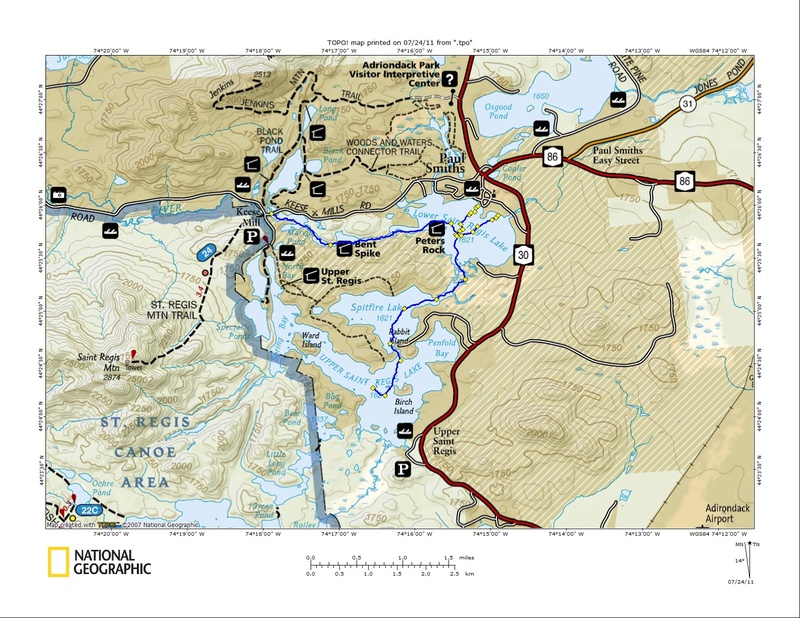 After paddling south through Spitfire Lake you pass a small island (Rabbit Island) as you enter the channel to Upper Spitfire Island. The island was posted, but there was a plaque on the island facing the water. 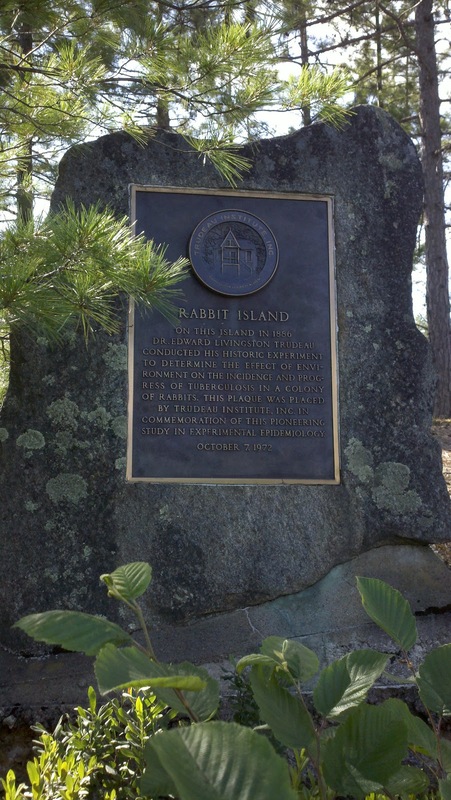 Apparently Rabbit Island is where Dr. Trudeau did his Tuberculosis experiments with rabbits in the late 1800's. 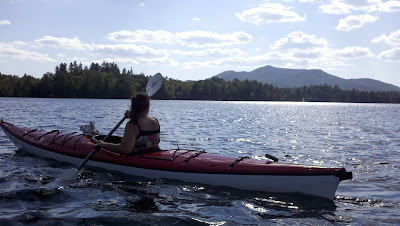 We reached Upper St. Regis Lake and paddled around 4 or 5 privately owned small islands before heading back the way we came. A bald eagle was soaring overhead as we made our way back. We reached the Peter's Rock leanto about 6 PM and it was still vacant. We decided to paddle back to the car, drive to Paul Smiths and relaunch the boats with the camping gear, headed for Peter's Rock. We got back to the car at 6:45 and were at Paul Smiths College by 7 PM. Looking across the lake with the binoculars, we saw that someone had taken the leanto we were hoping to use, so we enjoyed a little more padding at sunset before setting up camp at an unnamed leanto on the east shore of Lower St. Regis Lake, near a ranger facility. Sunset on Lower St. Regis Lake. 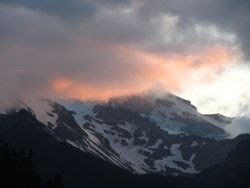 St. Regis Mountain in the background. 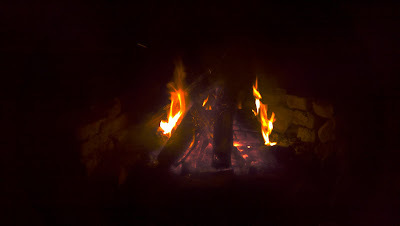 We enjoyed our campfire until about 11 PM and then fell asleep, having completed a perfect hike and paddle day.